Vivacom: Food Network is back on 12560.00MHz, pol.V SR:30000 FEC:3/4 SID:203 after a break ( PID:2203[MPEG-4]/2303 aac Bulgarian,2403 aac English - VideoGuard). Sky Digital: Nieuwe frequentie voor Food Network: 12382.00MHz, pol.H (DVB-S SR:27500 FEC:5/6 SID:2910 PID:2352/2353 English- FTA). Food Network (United Kingdom) is in DVB-S2 van start gegaan op 12137.00MHz, pol.V SR:30000 FEC:5/6 SID:231 PID:4101[H.265]/4102 aac Bulgarian - Conax. Food Network is back on 11891.00MHz, pol.V SR:30000 FEC:5/6 SID:99 after a break ( PID:1991[MPEG-4]/1992 - Panaccess). Focus Sat: Nieuwe frequentie voor Food Network: 12265.00MHz, pol.V (DVB-S SR:28000 FEC:7/8 SID:30917 PID:851/860 Hungarian,861 Czech,862 Romanian- Conax & Cryptoworks & Irdeto 2 & Nagravision 3). Food Network is back on 12245.00MHz, pol.H SR:30000 FEC:3/4 SID:4027 after a break ( PID:2702[MPEG-4]/2703 aac Czech,2704 aac English - Conax & Nagravision 3). Dolce TV: Food Network is back on 12175.00MHz, pol.V SR:30000 FEC:7/8 SID:251 after a break ( PID:550/451 English - VideoGuard). Food Network (United Kingdom) is in DVB-S2 van start gegaan op 11811.00MHz, pol.V SR:30000 FEC:3/4 SID:99 PID:1991[MPEG-4]/1992 Czech - Panaccess. Food Network is nu gecodeerd in BulCrypt (12456.00MHz, pol.H SR:30000 FEC:2/3 SID:437 PID:2012[MPEG-4]/2013 English). 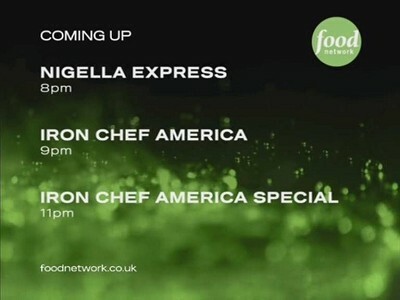 Food Network is back on 12456.00MHz, pol.H SR:30000 FEC:2/3 SID:437 after a break ( PID:2012[MPEG-4]/2013 English - FTA). T-Home: Nieuwe frequentie voor Food Network: 10806.00MHz, pol.V (DVB-S2 SR:30000 FEC:3/4 SID:1512 PID:4101[MPEG-4]/136 English,4111 Hungarian- Conax). T-Home: Food Network is back on 10806.00MHz, pol.V SR:30000 FEC:3/4 SID:1512 after a break ( PID:4101[MPEG-4]/136 English,4111 Hungarian - Conax). -115-SkyLink: Food Network (United Kingdom) is in DVB-S2 van start gegaan op 12129.00MHz, pol.V SR:29900 FEC:2/3 SID:20936 PID:536[MPEG-4]/136 English,236 Czech - Cryptoworks & Irdeto 2 & Nagravision 3 & Viaccess 5.0. Food Network (United Kingdom) is in DVB-S2 van start gegaan op 11449.00MHz, pol.H SR:27500 FEC:3/4 SID:15008 PID:167[MPEG-4]/108 English,109 Czech,110 Hungarian,111 Bulgarian - Conax. Cosmote: Food Network (United Kingdom) is in DVB-S2 van start gegaan op 12168.00MHz, pol.H SR:27500 FEC:2/3 SID:1130 PID:4130[MPEG-4]/5130 English - VideoGuard. Food Network is nu gecodeerd in Panaccess (11350.00MHz, pol.H SR:45000 FEC:3/4 SID:99 PID:1991[MPEG-4]/1992 Czech). A1 Bulgaria: Food Network is back on 11470.75MHz, pol.V SR:30000 FEC:5/6 SID:624 after a break ( PID:3401[MPEG-4]/3402 Bulgarian - Conax). Food Network is back on 11350.00MHz, pol.H SR:45000 FEC:3/4 SID:99 after a break ( PID:1991[MPEG-4]/1992 Czech - FTA). Direct2Home: Food Network (United Kingdom) is in DVB-S2 van start gegaan op 11595.25MHz, pol.V SR:30000 FEC:5/6 SID:943 PID:5601[MPEG-4]/5603 English - Conax. Food Network is encrypted again after being temporarily unencrypted on 12207.00MHz, pol.V SR:30000 FEC:3/4 SID:2730 PID:2731[MPEG-4]/2732 Russian,2733 English (VideoGuard). Food Network is back on 12207.00MHz, pol.V SR:30000 FEC:3/4 SID:2730 after a break ( PID:2731[MPEG-4]/2732 Russian,2733 English - FTA). Food Network is back on 12669.00MHz, pol.H SR:35000 FEC:2/3 SID:2148 after a break ( PID:1030/1031 Italian - FTA). Viasat Ukraine: Nieuwe frequentie voor Food Network: 12348.00MHz, pol.H (DVB-S SR:30000 FEC:7/8 SID:2730 PID:2731[MPEG-4]/2732 Russian,2733 English- VideoGuard). Viasat Ukraine: Nieuwe frequentie voor Food Network: 11222.00MHz, pol.H (DVB-S SR:30000 FEC:7/8 SID:2730 PID:2731[MPEG-4]/2732 Russian,2733 English- VideoGuard). Food Network is back on 12643.00MHz, pol.V SR:26666 FEC:2/3 SID:4027 after a break ( PID:2702[MPEG-4]/2703 aac Czech,2704 aac English - Conax & Nagravision 3). Vivacom: Food Network is back on 11595.00MHz, pol.V SR:30000 FEC:3/4 SID:203 after a break ( PID:2203[MPEG-4]/2303 aac English - VideoGuard). Dolce TV: PID zijn veranderd voor Food Network op 12606.00MHz, pol.V: PID:550/451 English SID:251 ( SR:30000 FEC:7/8 - VideoGuard). Food Network (United Kingdom) is in DVB-S van start gegaan op 11222.00MHz, pol.H SR:30000 FEC:7/8 SID:2730 PID:2731[MPEG-4]/2732 Russian,2733 English - FTA. A1 Bulgaria: Food Network is back on 11595.25MHz, pol.V SR:30000 FEC:5/6 SID:941 after a break ( PID:5601[MPEG-4]/5602 Bulgarian - Conax). A1 Bulgaria: Food Network (United Kingdom) is in DVB-S2 van start gegaan op 11595.25MHz, pol.V SR:30000 FEC:5/6 SID:941 PID:5601[MPEG-4]/5602 Bulgarian - Conax. Vivacom: Food Network (United Kingdom) is in DVB-S2 van start gegaan op 11550.00MHz, pol.V SR:30000 FEC:3/4 SID:203 PID:2203[MPEG-4]/2303 aac English - VideoGuard. D-Smart: Food Network (United Kingdom) is in DVB-S2 van start gegaan op 12072.00MHz, pol.V SR:27500 FEC:5/6 SID:1606 PID:106[MPEG-4]/206 Turkish,306 English - VideoGuard. Sky Digital: Nieuwe FEC voor Food Network op 11426.00MHz, pol.V: FEC:5/6 ( SR:27500 SID:52500 PID:2313/2314 English - FTA). Xtra TV: Food Network (United Kingdom) is in DVB-S2 van start gegaan op 11747.00MHz, pol.V SR:30000 FEC:3/4 SID:7685 PID:7686[MPEG-4]/7688 Russian,7687 English - Conax. D-Smart: Food Network (United Kingdom) is in DVB-S van start gegaan op 12188.00MHz, pol.V SR:27500 FEC:5/6 SID:1904 PID:104[MPEG-4]/304 English,204 Turkish - VideoGuard. Nieuwe frequentie voor Food Network: 12723.00MHz, pol.V (DVB-S2 SR:26666 FEC:2/3 SID:4027 PID:2702[MPEG-4]/2703 aac Czech- Nagravision 3). Food Network is testing in DVB-S2 FTA on 11914.50MHz, pol.H SR:29900 FEC:2/3 SID:7 PID:39[MPEG-4]/37 English. Dolce TV: Food Network in DVB-S op 12606.00MHz, pol.V SR:30000 FEC:7/8 SID:251 PID:351/451 Bulgarian (VideoGuard). Sky Digital: Nieuwe frequentie voor Food Network: 11426.00MHz, pol.V (DVB-S SR:27500 FEC:2/3 SID:52500 PID:2313/2314 English- FTA). Focus Sat & UPC Direct: Food Network (United Kingdom) is in DVB-S van start gegaan op 11804.00MHz, pol.V SR:28000 FEC:7/8 SID:30303 PID:201/210 Hungarian,212 Romanian - Conax & Cryptoworks & Irdeto 2 & Nagravision 3. T-Home: Food Network (United Kingdom) is in DVB-S2 van start gegaan op 10925.50MHz, pol.V SR:30000 FEC:3/4 SID:1512 PID:4101[MPEG-4]/4111 aac English - Conax. Canal Digitaal & TV Vlaanderen: Nieuwe SR voor Food Network op 11914.50MHz, pol.H: SR:29900 ( FEC:2/3 SID:20836 PID:536[MPEG-4]/136 English - Mediaguard 3 & Nagravision 3 & Viaccess 5.0). Canal Digitaal & TV Vlaanderen: Food Network (United Kingdom) is in DVB-S van start gegaan op 11914.50MHz, pol.H SR:27500 FEC:5/6 SID:20836 PID:536[MPEG-4]/136 English - Mediaguard 3 & Nagravision 3 & Viaccess 5.0. Meo: Nieuwe frequentie voor Food Network: 12130.00MHz, pol.H (DVB-S2 SR:27500 FEC:3/4 SID:137 PID:4385[MPEG-4]/4386 English- Mediaguard 3 & Nagravision 3). Meo: Food Network (United Kingdom) is in DVB-S2 van start gegaan op 12012.00MHz, pol.H SR:30000 FEC:3/4 SID:137 PID:4385[MPEG-4]/4386 English - Mediaguard 3 & Nagravision 3. Digit Alb: Food Network (United Kingdom) is in DVB-S2 van start gegaan op 10886.75MHz, pol.H SR:30000 FEC:3/5 SID:1032 PID:370[MPEG-4]/371 Albanian - Conax. DMC: Nieuwe SR voor Food Network op 11150.00MHz, pol.H: SR:21600 ( FEC:3/4 SID:18 PID:4101/4111 English - Cryptoworks). Food Network switched to Eutelsat 7 West A satellite at 11373.00MHz, pol.H (DVB-S2 , 11373.00MHz, pol.H SR:27500 FEC:2/3 PID:211[MPEG-4]/311 English). Multichoice Africa: Food Network (United Kingdom) is in DVB-S van start gegaan op 11977.00MHz, pol.H SR:27500 FEC:3/4 SID:415 PID:331/333 English - Irdeto 2. Sky Digital: PID zijn veranderd voor Food Network op 11344.00MHz, pol.H: PID:2309/2310 English SID:53260 ( SR:27500 FEC:2/3 - FTA). DMC: Food Network (United Kingdom) is in DVB-S van start gegaan op 11150.00MHz, pol.H SR:18386 FEC:3/4 SID:18 PID:4101/4111 English - Cryptoworks. Sky Digital: Food Network (United Kingdom) is in DVB-S van start gegaan op 11064.00MHz, pol.H SR:12667 FEC:3/4 SID:53260 PID:2310/2311 English - FTA. Sky Digital: PID zijn veranderd voor Food Network op 11344.00MHz, pol.H: PID:2310/2311 English SID:53260 ( SR:27500 FEC:2/3 - FTA). Sky Digital: Food Network (United Kingdom) is in DVB-S van start gegaan op 11344.00MHz, pol.H SR:27500 FEC:2/3 SID:53260 PID:2308/2309 English - FTA.